What Is Carnitine Core Liquid? What’s better than Carnitine Core Liquid? – Find out here. When on the hunt for a fat burner to help you accelerate your weight loss progress, you may be tempted to try one of the products that contains the greatest number of unique ingredients. But, in some cases, simple is better. This is just the case with Carnitine Core Liquid. Carnitine Core Liquid is made by MusclePharm, which is a well-known and very respected company in the industry. MusclePharm has a number of other hit products in their line-up, so it shouldn’t come as too big of a surprise that many experience great results from this one as well. But is it right for you? Let’s look at the pros and cons of Carnitine Core Liquid so that you can get a better assessment of whether this is a product you’ll want to invest your money in. This product is a blended ingredient, made up of four different ingredients that make up the proprietary blend called ‘Carnitine Core’. These ingredients include Acetyl-L-Carnitine, L-Carnitine L-Tartrate, Raspberry Ketones as well as Propionyl-L-Carnitine. We do not know how much of each of these ingredients is in the blend, however they all aim to do just about the same thing, so it would generally be comparable to 1000 mg of straight carnitine. Raspberry Ketones are one of the hot ingredients now on the market with everyone talking about what they have to offer. Some studies have illustrated that they may help to increase total thermogenesis in the body, ramping up the rate of fat oxidation. This could help you move forward and see greater overall fat loss results. Raspberry ketones also offer antioxidant effects in the body, so they may just help with combating free radical damage that could otherwise increase your risk factor for disease as well. To this, you have three variations of Carnitine. Carnitine works in the body by helping to increase the release of fatty acids, which are then utilized for energy more readily. Burning off body fat is a two step process. First, you need to get those fatty acids trapped inside the cell out. Once these are released, those fatty acids then need to be utilized as a fuel source so they aren’t simply converted back into body fat tissue. Carnitine helps with the release process. By taking this supplement, especially around points of exercise, you’ll increase the total level of fatty acids in the blood stream, which can then be utilized as an energy source during whatever workout you happen to be doing. This increases total fat loss taking place, while also potentially sparing muscle glycogen levels as well, since your body won’t be utilizing as many carbohydrates as a fuel source. Because you will have greater total fatty acid release from the fat cells, you may also notice that your energy level goes up while using Carnitine as well, thus you may be be able to perform more intense workout sessions. Even though it’s a decent product it’s missing some key fat burning ingredients and it did not make it to the list of the best fat burner on the market. All in all, this product is one that you can expect to see good results from. Research does show that Carnitine will help out with fat oxidation and may produce mild results in terms of weight loss. While there are more powerful products on the market that do contain stimulants, if you want something that is more gentle on the body that still gives you that edge on fat burning, this is a great choice. Does Carnitine Core Liquid Come With Side Effects? Because this product doesn’t contain any stimulants and has relatively few ingredients, your chances of experiencing side effects will be generally quite low. Most users will tolerate it fine and will not see any downsides of using it. earlier on in the day will help you avoid this issue. 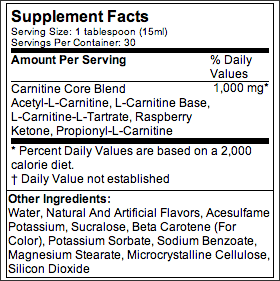 You can buy Carnitine Core Liquid at any major supplement retailor where you will find it for around $25-30 per 16 oz. serving. It’s also available in capsule form as well, so for those who really dislike taking the liquid, you may purchase it that way instead. How Do I Take Carnitine Core Liquid? For best results with Carnitine Core Liquid, you should take one tablespoon one to three times per day. This can be taken on an empty stomach or with food or other beverages. Mix it with water, take it on its own, or add it to your favorite fruit juice or protein shake. Are there better fat burners available then Carnitine Core Liquid? Since it’s missing some key fat burning ingredients and contains a proprietary blend we believe there are available some better options. See our top 3 recommended fat burners here. Morimoto, Chie, et al. “Anti-obese action of raspberry ketone.” Life sciences77.2 (2005): 194-204. Stephens, Francis B., and Stuart DR Galloway. “Carnitine and fat oxidation.”Limits of Human Endurance. Vol. 76. Karger Publishers, 2013. 13-23. Hi!! I have been using musclepharm carnitine core liquid since 2 months now. The first bottle went fine but the second and now third bottle gets this white strands in the liquid. This happens after a day of opening the new bottle. Though I never forget to refrigerate it. O mesmo aconteceu com o meu. Você continuou o uso?